Trees that Attract Bees | Mr. Tree, Inc.
Found in the Pacific Northwest, the American Basswood (Tilia Americana) – also known as Linden – is one of the top trees to attract bees. The Linden is a mid-sized tree growing to roughly 50’ tall and 30 to 35 feet wide with pale yellow flowers. They bud in June followed by summer nutlets – these flowers are called herb lime blossoms. The flowers are commonly used for herbal teas and tinctures while the tree produces a rich, monofloral honey. It’s best to plant a Linden in the fall after the leaves drop, although they can be planted in large pots at any time. Consult with a local professional such as Mr. Tree, in Beaverton, OR, to talk about placements or to clear a space in your yard if interested in planting a Linden. It’s also worth noting that Oregon has banned the use of four major insecticides on Linden trees in a further effort to protect them and the area bee colonies. In 2015, Oregon sold over $67 million dollars worth of cherries (Oregon Agriculture Facts & Figures) and one of the reasons the cherry tree thrives in the area is… yes, you guessed, they attract bees! 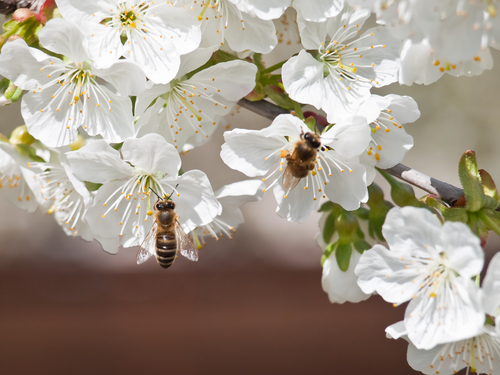 Most varieties of the cherry tree including the bitter cherry (Prunus emarginata) and chokecherry (Prunus virginiana) — both common to the Pacific Northwest — will attract bees in large numbers. They’re also the host to moths and butterflies. The chokecherry is a small tree in the prunus that clusters small white flowers in April to May, followed by purplish-black fruits that attract both bees and birds, followed by gold fall foliage. They grew to roughly 20’ tall and 15’ wide versus a bitter cherry tree that might grow to 50’ yet only 18” in diameter. While a benefit of the cherry tree is that planting one may results in many as they have a tendency to spread, do proceed with caution if you have cattle or sheep as they are toxic to such animals. The Pacific Crabapple (Malus spp.) or Oregon Crabapple is a small flowering tree that will grow 18 to 20 feet tall and 15 to 18 feet wide but provide a bounty of berry to golf-sized fruits in summer and fall. The showy blooms grow in white, pink, or magenta in May attracting bees – particularly the orchard mason bee. The Pacific Crabapple, of the prunus family, is the only native apple to the region. Our tree service experts in Beaverton, OR, will thereby serve well to guide you in planting and care to get the most from your crabapple be that to bear fruit or to entertain the bees. Not native to the area but one that will grow well and attract bees in the Pacific Northwest is the Sourwood Tree (Oxydendrum arboreum). Beautiful gold, scarlet, and purple leaves in the fall are replaced with lacy strands of creamy white bell berries bloom in August. These are beloved to the honeybee who likes those slightly fragrant, bell-shaped flowers, also attracting butterflies and moths. In the city, a sourwood can grow 25’ to 30’ tall. To thrive, the sourwood tree will want to have good drainage and dry mulch. Consult your local tree service for additional planting and care. The madrone (Arbutus menziesii) is a great tree to attract bees as well as a variety of wildlife, all contributing to the local ecosystem. While these can grow as tall as 100 feet, the trunk can serve to house woodpeckers, wrens, and other cavity-nesting birds while small animals will burrow into these cavities once they leave. In addition to the tree listed above, the maple (Acer), serviceberry (Amelanchier alnifolia), Oregon grape (Berberis), elderberry (Sambucus), snowberry (Symphoricarpos) and huckleberry (Vaccinium) trees are also likely to attract bees in the Pacific lowland areas. The more native the tree is to the climate, the more apt it is to attract a larger volume of bees. Tree services in the Beaverton, OR, area, would suggest a number of steps to help ensure you are planting or maintaining the indigenous trees. If you’ve seen bees in your yard, take note of which flowers they are drawn to, and try to get a good (but safe!) look at the bee. Sharing this information may help to determine which trees are thriving on your property and are most prone to attract bees. If you are looking to bring more trees and bees into your yard, determine when you are lacking a flower so that you are able to provide more nectar during budding seasons. For additional reading about bees native to the Pacific Northwest and Oregon area, which will include many species from the bumble bee to mason bee, check out this local resource. Read up on the tiny sweat bee, large carpenter bee, leafcutter bees, and more! In addition to having the right trees planted to attract bees, there should be clean water nearby, and a little surrounding mess of leaves and dead snags to encourage nesting insects. One last note that you would be sure to discuss with your tree service whether you are planting new trees or maintaining those already on your property: be sure that you are avoiding the use of chemicals that would ward off bees. Plants treated with systemic pesticides like neonicotinoids, which can be expressed in pollen and nectar, will prove toxic to bees. In review, survey your yard paying special attention to which trees’ flowers are currently attracting bees, at what time of day, and what these bees look like. Go to your local tree service company and discuss the care and maintenance of these trees to further entice bees to make their home there progressing the opportunity for more bees, more honey, more fruits and vegetables, and the essential expansion of bee colonies.